Forget all those perfect, pristine, magnificent, jealousy-inducing photos of sketchbooks and stop pressurising yourself by judging yourself against these, regarding these as what you ought to be achieving. The goal is to be sketching, drawing, paintings, visual-journalling. It doesn’t matter what you want to label it, nor does it matter what level of skill or success you do it with. What matters is that you’re doing it. Anyone who claims every sketch they do is perfect is lying or self-censoring or doing only what they know works and not extending themselves, not continuing to learn. Photos of sketchbook pages are selective; you rarely see someone showing every single page in a sketchbook. After all, we like to appear competent. 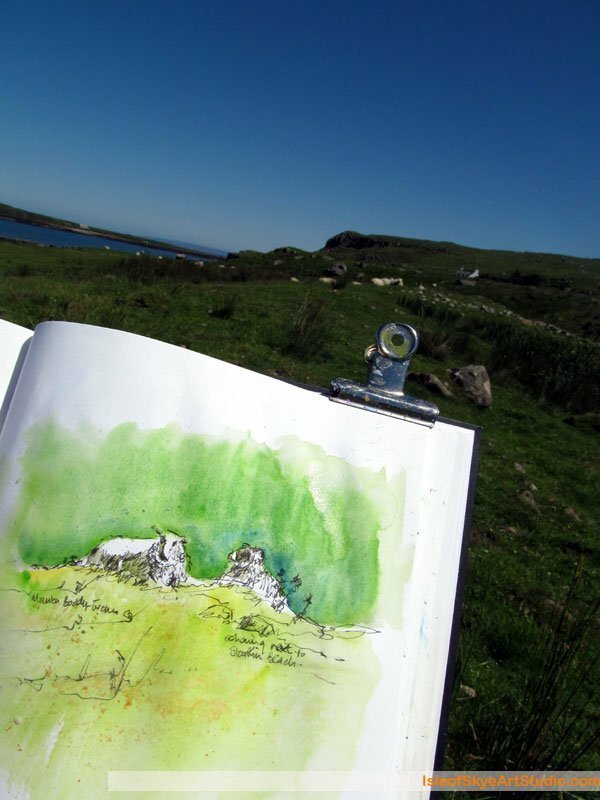 Take this photo of a sheep sketch for instance, taken on location after I’d finished it (see “Sunny Summer Skye Sketching“). 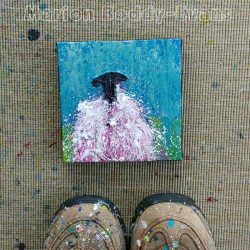 I know it was one of three I did of sheep on that spot, one after another; the other two were overworked duds. I resisted scratching through them in frustration and irritation; I certainly didn’t take photos! Sketching makes me look harder and longer. Serial sketching (multiple sketches of the same subject) helps me slow down, lets me try various ideas, and increases the odds I’ll end up with a “good sketch” rather than merely “recorded information”. You could call it hit-or-miss, but I prefer to call it visual exploration. This is a great post Marion. I don’t do a lot of sketching and more and more I realize that I should be doing so and the reason is I find that my sketches look terrible especially compared to a piece I’m focused on with all the detail. So this is a great reminder for me to not be so hard on myself and get my sketchbook out and take it with me and actually use it. Thanks Terry! I think the photos of fabulously finished sketches mislead us into thinking that’s what we should be doing, diverting from sketching being information gathering and observation. If you look at Monet’s sketches, you’ll see many that are only a few lines, the recording of an idea. There are some late sketches that if you didn’t know about his lily pond reflection paintings would seem like random scribbles. I needed to read this! I foolishly allowed someone to look at one of my sketchbooks – he found a picture of a rowing-boat and remarked that the perspective was wrong: I KNOW it was wrong, I didn’t need telling – it didn’t matter, so long as in the picture I painted from it, I got it right. 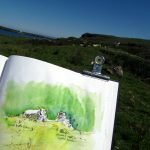 I’m often suspicious of pictures from people’s sketch-books which show almost perfect paintings in watercolour or excellent sketches: if you trawled though a dozen of mine, you’d find a few OK sketches and splashes of paint, but they’d be few and far between because that’s not what a sketch-book is for…. I think I shall leave instructions that my sketch-books should be burned on my death…..
Sketching is just that, sketching. it is not meant to be finished artwork, but you taking notes. playing around some times, but it does not need to be perfect. That’s not the point. It sharpens your powers of observation. Helps you focus. or simply to relax. Sketch does so much for you that making it have to be perfect is just adding a real burden to the process. That is why so many people avoid it, because they think they have to be perfect and it has to be complete. I have taken to sketch with a pen. So I can’t erase and have to simply go on. Yes, pen is great because as you say it forces you to simply go on, or start anew. None of the endless changing of mind that we can do with a pencil and eraser. I have found that my gestural sketching is much better than when I try to take my time and do it right. Working fast with quick looks at the paper is a much better way for me to get the figures down on paper for later reference. I think the thought that it’s a gestural sketch liberates us, gives us permission to get it wrong, and perversely that’s why we get it right because the pressure’s off and we don’t overthink it but let our inherent knowledge lead. Hello Marion, this has been really helpful tome. I was afraid to sketch anything just in case it was seen and I would be embarrassed. I will now sketch with impunity, what a wonderful feeling of release, thank you. Feel sure my art will now move forward. I really loved your article. The best advice I have ever read. What’s in a sketchbook needs relevance for ourselves only, bits of observations, thoughts, ideas etc etc. Don’t feel compelled to let people see a sketchbook either, but if you do, don’t apologize for it, leave people to take from it what they will. You know why you do what you do in it!